Most grown-ups jump at the chance to have a luxurious bath and bath time can also be a favourite time of day for babies and young children. Not only do baths clean and relax children in preparation for bedtime, but water and bubbles offer great sensory play opportunities. 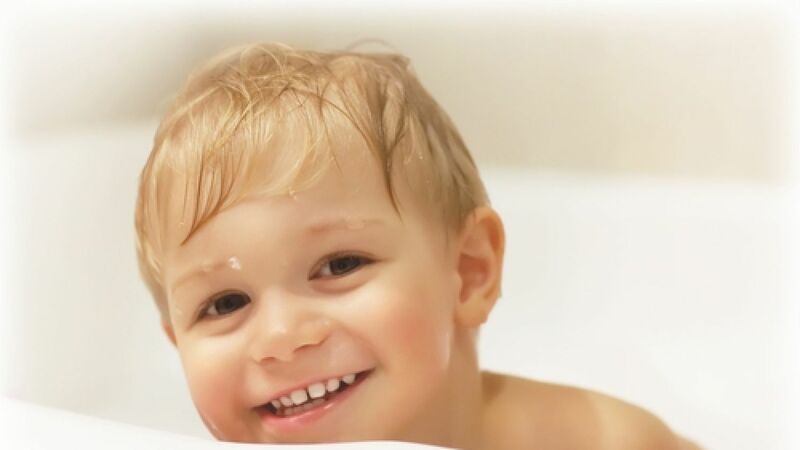 To ensure bath time remains enjoyable for kids, it's important to take safety precautions to eliminate the risk of drowning and scalds from hot water. From the first day you bring your baby home, it's important to ensure that your bathroom is safe. This means using non-slip floor and bath mats, storing sharp items (like tweezers and scissors) and cosmetics (like shampoo, soaps and lotions) out of reach of children. Remember also to remove electrical appliances (such as floor heaters and hair straighteners) out of the bathroom. Check the setting on your main hot water system so that the maximum water temperature provided is 50ºC. This simple action reduces the risk of a serious full thickness burns which can occur within seconds. Install tap covers to stop children turning the hot water on. The next step is to purchase a bath thermometer to ensure the bathwater is no more than 38ºC before your child gets in. Alternately, there are decals, floating devices or bath mats that are temperature sensitive and change colour if water is too hot for children – bathwater should be tested before every bath! The way you fill up the bath or turn on the shower is also very important. Start with cold water, then slowly add hot water, then finish with cold. This reduces the risk of kids falling into a bath full of only hot water, as well as ensuring the tap itself cools down. The MOST important aspect of bath time safety is SUPERVISION. Children should never be left alone in the bath or shower. It only takes a few seconds for a baby or toddler to drown or suffer a no-fatal immersion which can also result in very serious injury. Be prepared! Have everything you need at hand and if you really must leave the room, take your baby or young child with you. You should stay within arm's reach of your child at all times when they are in the bath or anywhere near water. If you use a baby bath aid, remember they are not safety devices. Always keep at least one hand on the baby to ensure the child does not slip under water. Older children should not be expected to look after a younger sibling at bath time - regardless of how responsible they might appear! Children have short attention spans and can be easily distracted – they also don't understand the consequences of what could happen. When the bath is finished, empty the water immediately and close the bathroom door as you leave the room. Lastly, have fun with your child at bath time! It can be enjoyable and relaxing and is an opportunity for a child to develop water awareness in a safe environment.